The Martin Yale 4200 Jogger aids in removing static electricity and thus helps in efficient paper processing avoiding paper jams. The 4200 Tabletop Paper Jogger has an open design and has three walls instead of four to load and unload the papers easily into the jogger. 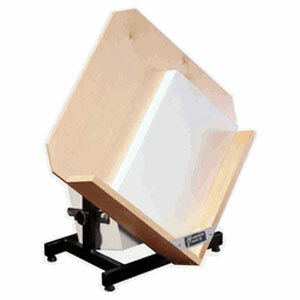 The Tabletop Paper Jogger 4200 is capable of handling paper of sizes up to 17” x 22” x 3”. It has a heavy gauge steel construction which is durable and weighs just 50 lbs. With just a press of a button the paper will be dried up within no time. It precisely aligns the papers without consumption of too much electricity. The Martin Yale -4200 Jogger can easily be kept in your office and has a high sheet capacity with seamless operation. The 4200 comes with an extra tray and full tilted machine which is useful for comfortable paper handling. It is useful in mailing room, corporate offices etc.